Is it a Jewish value to yield or to resist? The El Al security official at the L.A. airport eyed my mother-in-law suspiciously. She couldn't imagine what the problem was. The security official looked hard at my mother-in-law, studied her passport, looked up again at her face, gazed down again at her passport, and finally called over his colleague. "Look at this woman," he commanded. "Her passport says she is almost 90 years old. Can that be true?" Like the El Al security official, I have always been perplexed by my mother-in-law, Evelyn. Visiting Jerusalem at the age of 88, she made daily pilgrimages to the Western Wall, trekking up 135 steps. Even while celebrating her 90th birthday this week, she still walks with a bounce in her stride. Even more mystifying is her universal popularity. Everyone she meets -- no matter how distant from her in age, geography, or background -- adores Evelyn. This includes: her young Persian neighbors; my religious friends; the Hispanic plumber and his wife; the single, 40-something daughter of her best friend; and a young Israeli mother in Austin, Texas, who met Evelyn five years ago and continues to call her every Friday to wish her "Good Shabbos." One Sunday Evelyn didn't answer the phone when we expected her to be home. "I was at a graduation," she explained the next day. "It was the son of this big Italian family. I was the only non-relative invited." What is the secret of my mother-in-law's universal popularity? Recently, at a class on the mitzvah of lighting Shabbat candles, I discovered the answer. Many Jewish women follow the custom of lighting one Shabbat candle for every member of her family, honoring not only Shabbat, but every member of the family. Honoring other people is a core value in Judaism. Ethics of the Fathers, our 2,000-year-old guide to interpersonal relationships, proclaims: "Let the honor of your student be as dear to you as your own, the honor of your friend like the honor of your Rabbi, and the honor of your Rabbi as much as the honor of Heaven." As for marriage, the Talmud directs: "A man should love his wife as much as he loves himself, and honor her more than himself." Take a step back and allow another's reality to prevail. How does one actually honor other people? The key is to validate their reality. Usually our own reality is so intrinsic to us that we dismiss other people's reality as insignificant, flawed, or warped. To take a step back and allow another's reality to prevail permits the other to feel his/her own importance. This is the essence of giving honor. And this is why everyone loves Evelyn: she honors them by validating their reality. When she is with the family of her eldest son Bob, who moved to San Francisco in the 60s and joined the counter-culture, she appreciates their life style, the quaintness of their Mill Valley home with its hot tub, and her daughter-in-law's talents in making pottery and jewelry. 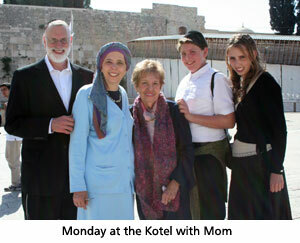 When she is with her second son Leib Yaacov in Jerusalem, she embraces our religious ways and admires our choices. When her youngest son Jamie, who heads a foundation for the arts, takes her to a formal dinner honoring Pavarotti, she enjoys the elegance of the event, hobnobs with the stars, and appreciates Jamie's kindness in bringing her. No wonder everyone adores her! Such validation requires much yielding of one's own propensities and choices, and poses a challenge to the ego. It would require a physicist to validate the reality of his teenage son who gets bad grades in science and who spends his evenings strumming his guitar. It would require a wife who's an expert at multi-tasking to have patience for her husband who can't be left to both take care of the kids and remember to take the roast out of the oven on time. Validating another's reality is the key to honoring others, which is the key to peace in the home and is the inner depth of the mitzvah of lighting Shabbat candles. How different are the candles of Chanukah! Chanukah is the holiday of standing up boldly for your beliefs, of not yielding an inch. Chanukah commemorates the historical victory of the Maccabees over the Greeks. The Jewish rebellion started in the year 167 B.C.E., after a century of Greek cultural hegemony and increasing assimilation. In the village of Modiin, Greek forces commanded the Jews to make offerings to a pagan god. One submissive Jew complied. This so enflamed the elderly priest Mattathias that he sprang up, killed the servile Jew, and led his five sons and handful of followers into the hills for a protracted guerilla war against the Greeks and their Hellenistic Jewish cohorts. The message of Chanukah is: Hold onto your religious convictions, never submit to the assimilated majority, no matter how numerous or sophisticated they are, and fight for your ideals. So which is the Jewish value: to yield or to resist? The salient difference between the lights of Shabbat and the lights of Chanukah are their location. Shabbat candles are always lit inside the home. Chanukah candles should ideally be lit outside, by the entrance to the house. (This is how we still do it in Jerusalem.) Only when the Jews were exiled to the Diaspora did safety dictate moving the Chanukah lights inside, but even there they are to be kindled in a window where they can be seen from outside. The mitzvah of lighting the Chanukah candles is to publicize the miracle of the oil. While the Shabbat candles illumine the private domain of the home, the Chanukah candles are a statement to the public domain. Yield in the home, but stand up and fight in the public realm. Similarly, the place for yielding is in the home, within the family. The place for standing up for one's convictions is the public realm. Unfortunately, we often reverse the two: A Jewish college student who is afraid to stand up to his politically correct friends and defend Israel refuses to yield to his mother's entreaties to wear a tie to his grandparents' anniversary party. A Jewish woman who sits mutely during coffee break while her co-workers joke about "cheap Jews," finds her tongue and waxes eloquent in her self-defense when her husband asks her to put the kids to bed on time. The place to stand up for your beliefs is the public realm. In the home, yield, yield, yield. If you are chronically tardy, and your spouse likes to arrive everywhere 15 minutes early, yield. Ask yourself, "What is his/her reality?" and validate it. If you are a spendthrift and your spouse is frugal, yield. Ask yourself, "What is his/her reality?" and validate it. If your idea of a vacation is a five-star hotel, and your children want to vacation in the national parks, ask yourself, "What is their reality?" and validate it. Then decide what is best for the whole family. But in the public realm, when Judaism, Jews, or Israel are under attack, stand up and fight! That's the lesson of Chanukah. If you stand up for Israel in university (England) that is really stupid because no one listens and you just end up isolating your self. Tried and tested. Its better just to keep quiet. I want to be like her. I will put it into practice. That's Love, sacrifice. Appreciation and acknowledgment of others. Courage even unto death. Straight out of the Bible. Reminds me of marital advice I read years ago. When you are dating be critical; examinge every trait and choose your mate wisely. Once you are married be gentle; value your spouse and accept his/her flaws as a part of the whole person who is your life-mate. It's great to read about someone one can identify with, i.e. Sara Rigler's mother-in-law. I made Aliyah six years ago at the age of 85; was written up in the Jerualem Post; constantly meet people who say, We've heard so much about you, am asked to recite my poems wherever I'm invited for Shabbos; my closest friends could be my grandchildren. i can't yield. why shouldn't she? Mrs Riegler's point is that both husband and wife need to care to understand and respect each other's position and in doing so they will find a modus vivendi acceptable to both. On some points one can say: " I just cannot change this one point. If I ask you to yield all the way on this, where can I compensate you? Where can I give and go all the way or you?" I wish you all the best ( did you try counselling?) Lea M.
They say marriage is 100% commitment-but it has to be on both sides. BOTH sides have to yield, if not all the time then some of the time at least. I think one person ALWAYS yielding becomes a doormat. Both people yielding, meeting in the middle (hopefully) makes a marriage. Good luck. I also agree with the other poster, invest in a good marriage counselor. It is very well worth it. Now is the time to standup--- in the streets. Unfortunately we will be called on to take to the streets, the Universities and perhaps the Mosques. If standing up mean to fight back the Islamic hoards and if fight back mean physically that we must do not just in Isreal but in North America and even York University. I love these ideas, but what happens when a family member wants to do something against Jewish principles/law?! e.g. your young child who you are trying to educate... there's a time to stand up to ones convictions within the family too! Separating the two, the family issues you brought up are not worth the fight, small things that doesn't have much to do with our religious freedom. Taking inventory at this time of year to see where we have "gave in" without thinking of it. Whether it was by choice or by peer pressure and rededicating ourselves to the Master's Hand. Taking back the Temple; taking back control of our own lives according to the convictions our Master has given us. You have both clarified and simplified a very difficult subject. I find your discussion extremely useful. Thank you. Wow! That was really special! Thank you so much for sharing those beautiful thoughts. Your mother in law certainly teaches us a valuable lesson. what a beautiful life lesson! as well as a recipe for longevity. till 120, Evelyn!